Become a recipe publisher - instantly! Start The Day you receive your package! or use both to create income! You receive FULL reprint rights for all 60 recipes and ad materials. A - Good - Seller - for you! Stay Home & Make MONEY! and other advertising media - already done for you along with the 60 recipies! NO credit card orders as of August, 2013. 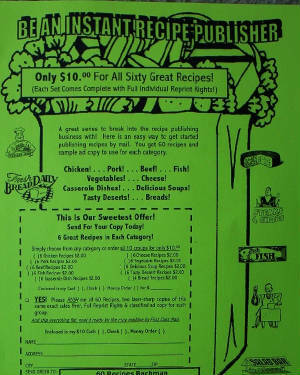 Send a $10 money order** (save $2) and a copy of this ad, for your complete business package to: Bob Bachman, P.O. Box 243, Olyphant PA. 18447. Copyright, Bachman Publishing Co. All rights reserved.